For those looking for a sci-fi tale replete with guns, space ships and heavy metal bounty hunters, I present Ghost Junk Sickness. Created by Kristen and Laura Lee (Fine Arts graduates and sisters operating out of Kingston, Ontatio) GJS is a project that marries their mutual affinity for space-based sci-fi adventures, as you will see in the following interview. GJS follows the duo of Trigger Elliot, a struggling bounty hunter, and his partner, Vahn. At the time of publishing, we have gotten acquainted with the majority of the main cast, and Vahn’s curious nature is coming to light. We are clued in to the mounting tensions between the two military powers vying for dominion over a catastrophe-scarred world called June7. A bounty hunter killer named “The Ghost” is set to cross paths with Trigger and Vahn. As the story is still in its early phase, I would strongly urge that you take a detour to their website and catch up. It’s well worth the read, and has found its way into a regular slot in my weekly media viewing cycle. You can find page 1 of this series here. It was my pleasure to interview the web comic’s creators and gain some insight into the process of bringing GJS to life. Note: At various points in this interview, individuals will be identified as “they” rather than him/her. This is because the character is either not gendered or has not had their gender identified. Approaches to storytelling vary among creators. Some construct entire worlds before putting the plot into motion, whereas others build their worlds as they go. 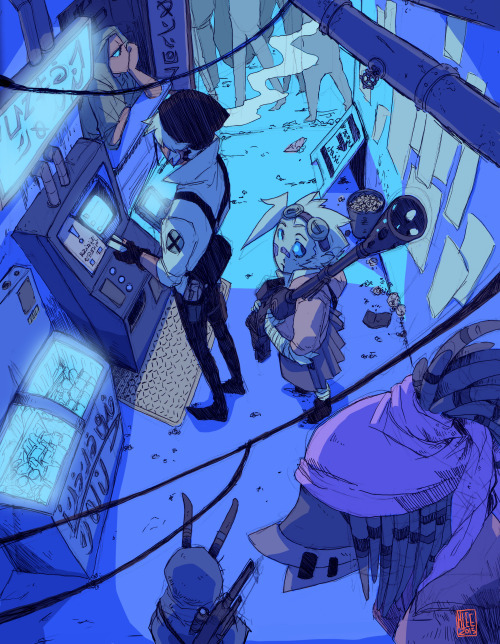 As Ghost Junk Sickness has two creative minds behind it, both working on the comic equally, how do you two decide on the direction of the story and the lore of the universe? Kristen: A big part of it was aesthetics and common interests. We both decided that we liked space/scifi themes, occult elements and bounty hunting-themed manga. So, from there we just collaborated and would agree on what kind of themes would work and suit the story as a whole. Typically, we would derive a concept from something we liked and work it enough so it becomes separate from the original line of thought and totally our own. We did a lot of research into different things, though I think that’s a given. Laura: Basically, we would have key points down, and there would be specific visions of characters or scenes that we wanted to see come into play. We would map them out and then just problem solve and work on how we would get there, although sometimes the scenes would turn out completely different from how we thought they would. It still worked out for the better. We’re always very conscious of what we want to portray and represent, so these key points were crucial to finish 100% in context. In our way of preparing a story, we have it all done completely down to each individual page because we always had a tendency to run into plot holes and issues if we didn’t finalize it. We’ve basically written the whole story twice now with the amount of revisions, and let me tell you, it was definitely beneficial. Have you maintained the original overall course of the plot, or have your revisions seen the characters meet wildly different fates than the ones for which they were originally slated? Both: Absolutely! The core of the plot still maintained the essential parts of it, but huge arcs have been rewritten to be told in a different way entirely. Settings completely change, characters’ involvements are reconsidered and character deaths were taken out entirely for a better possibility. There are still parts in the comic that we might want to rewrite if we feel they don’t leave enough impact. The series is going to be 10 books long, so we definitely have the time. Speaking of characters, General Fiachra has quite the posse behind her. From a design point of view, what were the influences behind Fiachra’s Elite? Laura: I designed pretty well most of the characters. As for how my process goes, I have a certain vibe that I want to present for whatever role, and I work from there. For Raine’s elite, in particular, there are different elements and images that I would take from and just stem a character from it. I know I wanted a stoic/loyal character (Shadi) and then a more ruthless and erratic character (Beetle). And of course, I wanted one that was closest to Raine herself, since two wasn’t enough, which more or less became a fusion of Beetle and Shadi’s archetypes (Cicero). Design-wise, I wanted them all to look different from each other. I wanted them all to clash, but work at the same time, so they would just look like this diverse group that somehow got along. I like beetle horns and I like sharp eyes and ridiculously long eye-lashes, which then created a whole race that exists in the GJS universe. For Beetle, she’s actually inspired by someone I know. Sometimes, I like a person’s personality so much that I make them into a character, but change enough so that they’re not recognizable. Other than that, the only thing I can think of is Beetle’s mask, which is influenced by Neon Genesis Evangelion. Cicero was a product of wanting more Bolobogans (Boggmouth’s race) as characters, and from there, his personality was inspired by Wrex from the Mass Effect series. When I say inspired/influenced, I mean it in a way where the vaguest image is taken and just completely morphed into something new. Once we see these characters interact more and show more about themselves I’d say it’s hard to see where the inspiration comes from. Even Cicero whom I even imagine with Wrex’ voice is a completely different character than Wrex himself, unless Wrex suited himself to be Shepard’s personal lap dog and did pretty well anything for them ahaha! 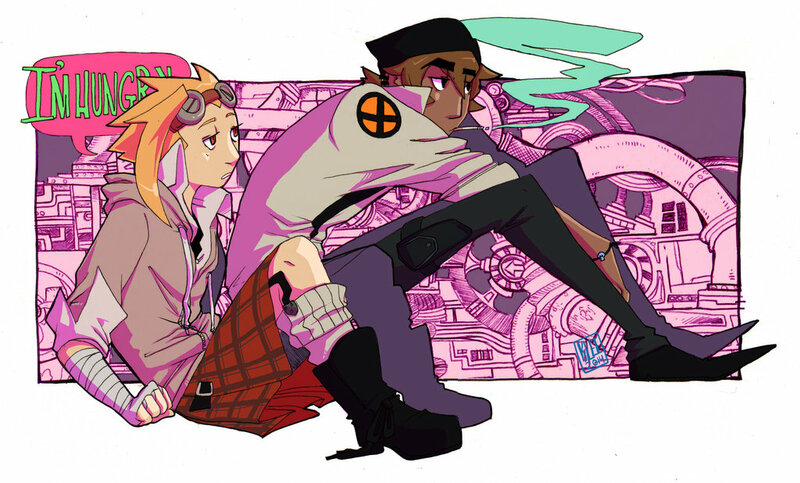 Raine herself is actually a pretty old character who was inspired by Haruko Haruhara from FLCL. 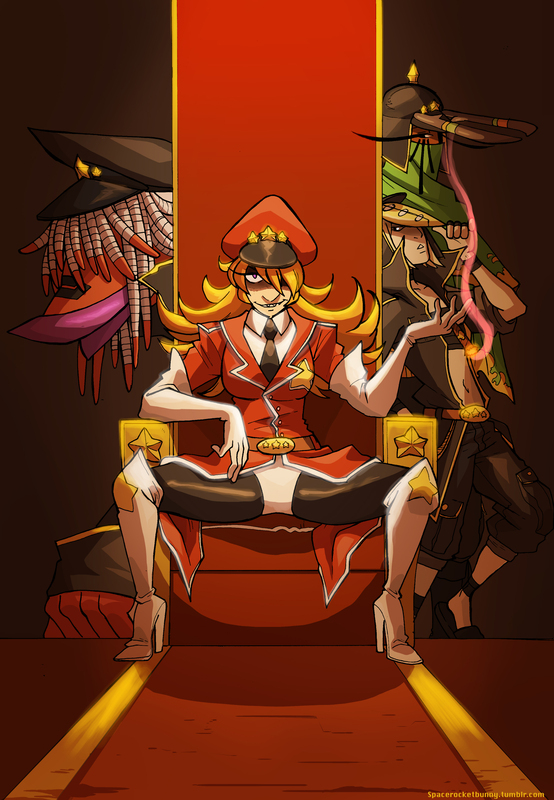 She and her outfit are pretty bizarre for a military General, but what I wanted to show with her and her elite was that she did as pleased, presented herself as she wanted and surrounded herself with people who thought on a similar level. This is shown in their liberties on their own uniforms and their blatant disrespect towards anyone who isn’t within Fiachra’s forces. Is there any one character for whom either of you has a special affection? Kristen: Vahn, because they’re one of the earliest characters that I’ve ever made. Vahn has been a work in progress character that I never really figured out; they’re actually a 15 year old character that we spent all this time just trying to pin down. I’m just really happy that we’ve finally found a place for them and they’ve turned out to represent something way bigger than we thought they would. Laura: I have extreme favouritism towards “The Ghost”. While writing, we did as much as we could to make sure each character was given the amount of attention that they need, but my favourite parts are when The Ghost finally makes more of a presence in the story. They’re a very important character to me, and I can’t wait to show more about them as the story progresses! Other than that one Boggmouth is another character for whom I have a great deal of affection. Not only is she another crucial character in the story, but she’s also my favourite character from a design standpoint! 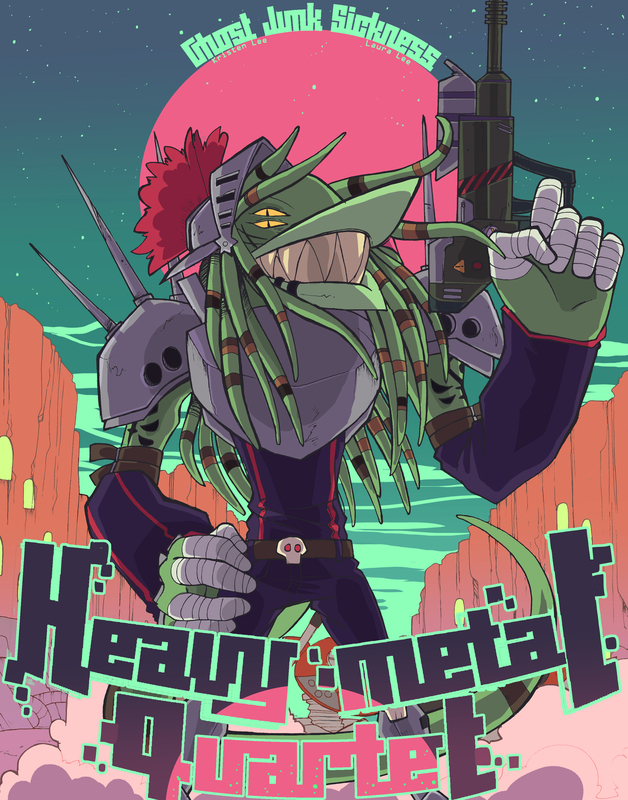 Quick follow-up with regards to Boggmouth: if she was around in our world today, what would her top three heavy metal bands be? Laura: GOOD QUESTION. Boggmouth’s top 3 would be Iron Maiden, Rob Zombie and Black Sabbath! How easy is it to work with a sibling dynamic? Does the familiarity make it easier to get on the same page, or is there a fair bit of creative compromise? Kristen: Well, the thing is, it’s extremely easy because we get along pretty well. It took us a while to establish our roles (Laura as the one that draws and myself as the one who inks the pages) but once we got past that part, everything became a lot easier. The advantage of us being siblings is that when we did have issues or arguments over the comic, we would eventually be able to work it out, as opposed to just being friends and cutting ties if the fight was bad enough. We see each other every single day, so it’s kind of hard to work and carry on with our day without at least saying something to each other. Laura: We’ve had major advantages over other pairs because we practically grew up with a lot of the characters that we have in our story. Familiarity is a huge bonus because we’re always on the same wavelength. We never had to worry really about explaining ourselves in depth and trying to make each other understand a concept because it was always there anyway. When we talk about arguments we’re referring to instances where revisions had to be made and the other wasn’t willing to backpedal and redo something. In the end, though, it was always just to make our story better and better because, let me tell you, it would have been a completely different story if we went with our first or second draft. You can connect with GJS via Facebook, Twitter and Tumblr.